February brought on the most sickness we've had to deal with in at least a year. Croup swept through the family with Martin and Josephine getting it twice. Elliot, Mummy, and Daddy were fortunate enough to only each come down with croup once. Before the croup was to infect our home we were able to celebrate Chinese New Year with Josie enjoying her first ever pork dumplings. 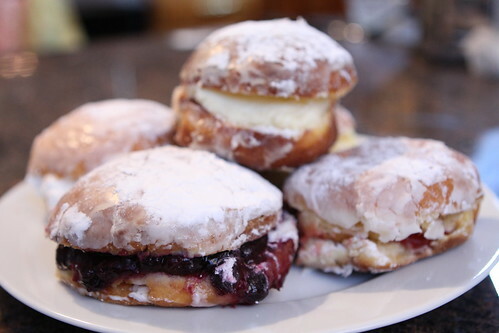 The following night we had Mardi Gras breakfast for dinner followed by paczki which surprisingly the boys did not seem to enjoy as much as I would have expected considering they are the most delicious pastry I've ever consumed in my life. Before falling sick herself Josie was on the move, inching closer every day to crawling. She has also had a great time playing the piano with me on my days off. The boys have continued to expand their love of Hamilton with impromptu performances of new songs. Here they are singing a slowed down, soul version of "The Schuyler Sisters." Martin eventually developed a fever of 103 and was so miserable that I had to take him out for a walk in the freezing cold air to help his lungs. It worked well but you could tell he was sick because he was silent for our entire 45 minute walk where normally he would have spent the entire time telling me about the Teenage Mutant Ninja Turtles. He managed to put on a great fake smile for me when I came around to see how he was doing. His hat was completely covering his face but he was too sick and tired to even bother asking me to remove it. On Valentine's Day Jen set up some great breakfast tables for the kids while I was at work. That night we had dinner with the family. Soon after that Josephine got sick and while she spends most of her days laughing and smiling she was a wreck. There was little or no sleeping or napping while she fought a fever that got up to 104 one night despite our intense regimen of alternating ibuprofen and acetaminophen. After a few days everyone shook off the last round of croup and were able to play inside to build a bear cave on the freezing cold days. Josie's mobility increased every day. We wouldn't see her do anything but when we would check back she'd be across the room. The kids had a "Noodles and Doodles" night at school where we ate immense amounts of spaghetti and I got to make a macaroni necklace for the first time in over thirty years. With Josie moving about I brought up the boys' old play center from the basement. Unfortunately she was evicted from it immediately and they set it up as a jail where Batman could put bad guys, something they had previously only been able to enjoy in the basement. Josie has had tons of new foods including pancakes, waffles, strawberries, grapes, and oranges. All of that has paled in comparison to her first go at some chocolate brownies at Auntie Lauren's house. We were able to get a small portion of the basement carpeted again after our December sump pump flood. 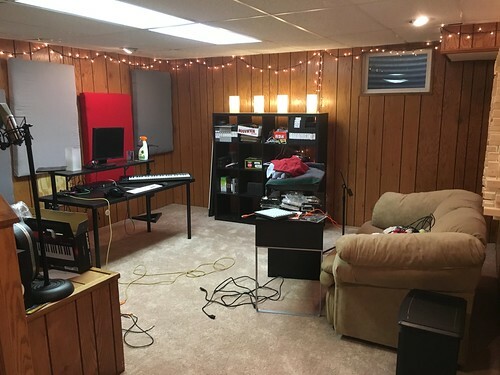 This has been just enough for me to set up the music studio again for the boys to play. One day I may even get to use it again. It is a huge relief to have this back up and running. Elliot has spent a lot of time playing the trombone and violin. Martin has mostly focused on his guitar and keyboard chops. And, finally, a couple of nights ago Josie made her first real crawl across the floor, beating her brother Elliott's record by almost a month. As I write this she has made tremendous progress and now can crawl extremely quickly. With her brothers this was a pivotal moment in our lives getting harder. I fear that the ease of having three children has just been washed away. We had it easy anyway.